Francis Bernardone grew up in luxury as the son of a wealthy cloth merchant in Italy. Then God captured his heart when he wandered into the old church of San Damiano. He heard a voice as he knelt before the crucifix which said “Francis rebuild my church, it is falling into ruin.” Francis immediately sold some cloth to pay for repairs. His furious father took him to court, where Francis renounced his inheritance, laid his clothes at his father's feet and walked off naked. Wearing a rough tunic, tied with a rope, Francis attempted to repair the church with his own hands. Soon others drawn by his passion joined him and the Friars Minor, known as the Franciscans, were born. Francis wanted to live the Gospel of Jesus Christ just like the Apostles. He followed his heart, acting on whatever God filled it with. He feared nothing, not even his own weaknesses, because he knew God would supply whatever he was lacking. As the Order flourished, Francis remained a simple friar. As his heart sang out like a lovestruck troubadour in praise, he was overcome by God's majesty in every living thing. He preached to birds and even persuaded a wolf to stop terrorizing a village. Deeply united to Jesus, Francis was the first person recorded to receive the stigmata. Francis misunderstood God's request “rebuild my church”, not realizing he was being asked to renew the very heart of the entire Church, or he may have run the other way. If God revealed His plans for you all at once, you would surely be overwhelmed, but if you take one step at a time and just trust Him, there are no limits. 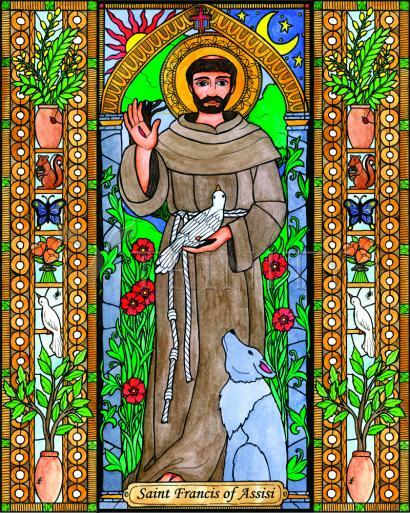 Francis of Assisi was a poor little man who astounded and inspired the Church by taking the gospel literally—not in a narrow fundamentalist sense, but by actually following all that Jesus said and did, joyfully, without limit, and without a sense of self-importance. He must have suspected a deeper meaning to “build up my house.” But he would have been content to be for the rest of his life the poor “nothing” man actually putting brick on brick in abandoned chapels. He gave up all his possessions, piling even his clothes before his earthly father (who was demanding restitution for Francis’ “gifts” to the poor) so that he would be totally free to say, “Our Father in heaven.” He was, for a time, considered to be a religious fanatic, begging from door to door when he could not get money for his work, evoking sadness or disgust to the hearts of his former friends, ridicule from the unthinking. During the last years of his relatively short life (he died at 44), he was half blind and seriously ill. Two years before his death, he received the stigmata, the real and painful wounds of Christ in his hands, feet and side.